Recent Events – We’ve Been Busy! With so many exciting events, classes and transitions, we’ve been incredibly busy lately! Here are a few of things we’ve been up to over the last few weeks. Be sure to follow us on Facebook to stay up-to-date on upcoming events we’re hosting or involved in. The Adaptive Rec Expo at the Hamburg Community Center on Saturday, September 22, 2018, gave attendees a chance to learn about sled hockey, roller ball, wheelchair basketball and other sports, and participate in fun games. Adapted sports equipment demonstrations and other presentations provided information and contacts for getting involved. UD Yoga screened the UD Sled Hockey video (watch video here) for interested folks to try out. The best part about this video is that it’s designed for everyone - you do not have to be a sled hockey athlete to benefit from this 14 minute yoga practice! UD Yoga is yoga that is designed for anyone interested in yoga to develop a safer, and comfortable yoga practice. It’s for all abilities and levels, and the goal is simply to relax, be mindful of your self, and feel better when you’re done! We love participating in events such as the Adapted Rec Expo where we can help athletes and aspiring athletes improve themselves, have fun and learn something new. We were thrilled to attend and lead a class at this year’s Exceptional Experiences Expo at the Museum of Disability History on Saturday, October 13, 2018. It was such a rewarding and interesting event! We are grateful to Nick Helig, the E2 Expo visionary and organizer for including UD Yoga. 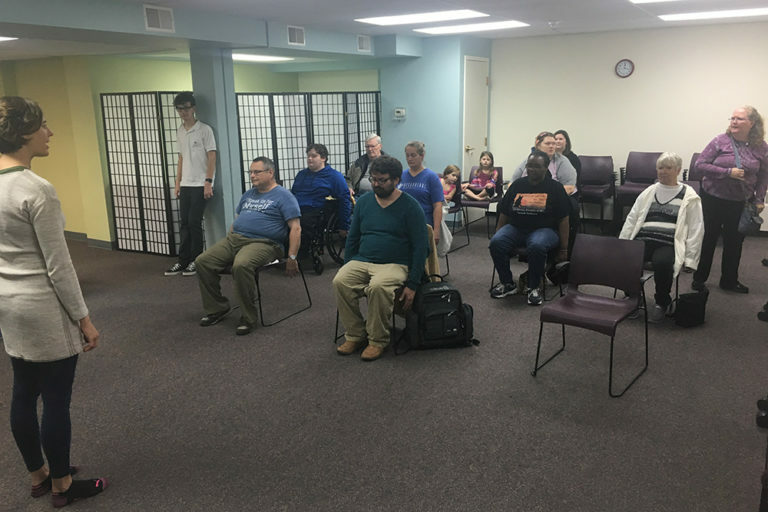 Elyssa Bourke, a UD Yoga teacher, led a seated UD yoga class for a diverse group interested in learning more about yoga classes designed for people who experience the world in lots of different ways. We had a wonderful time following the UD Yoga class meeting with over thirty groups who provide many different ways for people to get involved in the community. What a fun way to spend an autumn afternoon and learn more about people making Western New York more inclusive. UD Yoga on UB South Campus! We’re excited to announce that UD Yoga at UB has moved to South Campus. Tuesday, 10/9/18 was our first class in the Harriman Ballroom. The UD Yoga classes will continue on Tuesday afternoons from 4:30 - 6 through November 13, 2018. 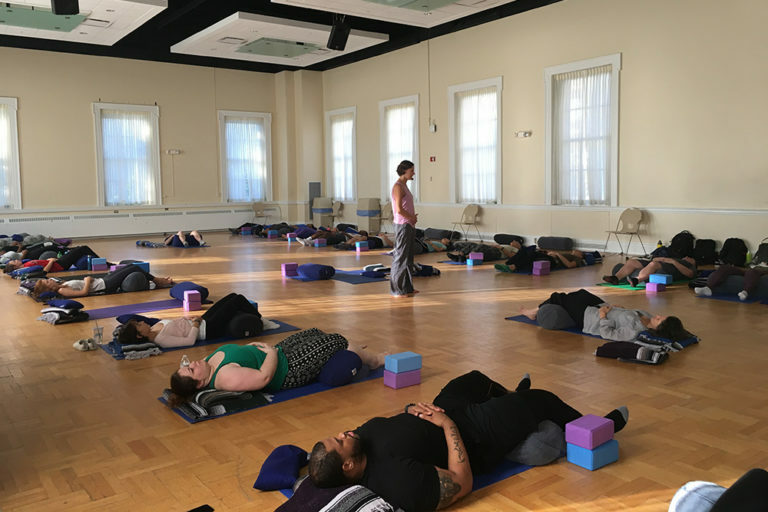 We had a blast exploring the new space, trying some new strategies for making the UD Yoga classes safe, welcoming and comfortable for everyone. Come see us and our new space for a class and see how UD Yoga feels for you! We’re excited to see how this move can help us improve our mission of bringing safe, universal yoga classes to anyone interested in practicing. 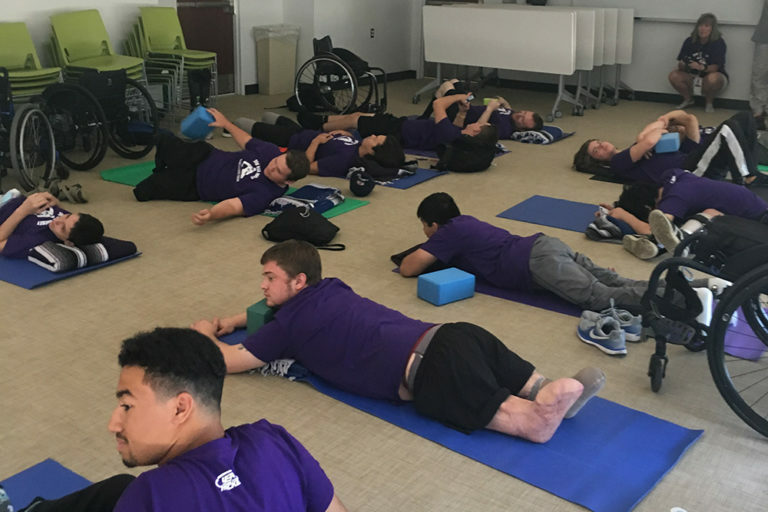 « UD Yoga at USA Sled Hockey Development Camp!